Will the Last One Leaving the Bay Area Please Turn Out the Lights? As our oft-quoted Chief Market Analyst, Patrick Carlisle, says in his recent report, “That sounds really bad.” It turns out that the sensational headline stories quoted above were largely based on questionable and selective data and then amplified in the media in the ways that we’ve all become accustomed to. 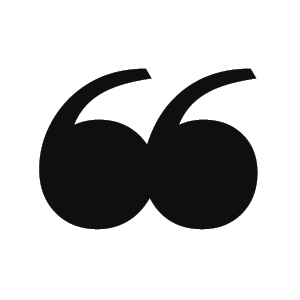 This month, I’m reposting an abbreviated version of Patrick’s report. 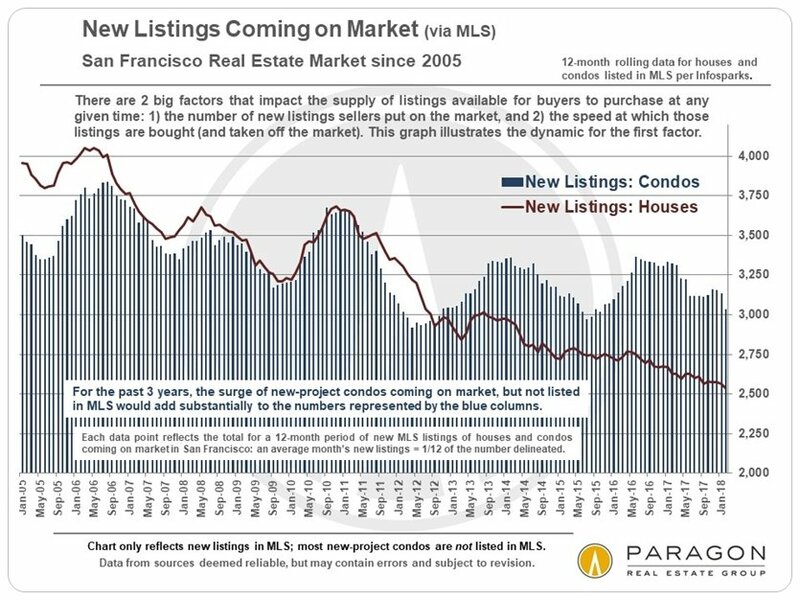 The bottom line: if everyone’s leaving the Bay Area in droves, you’d think it would be showing up in real estate prices. 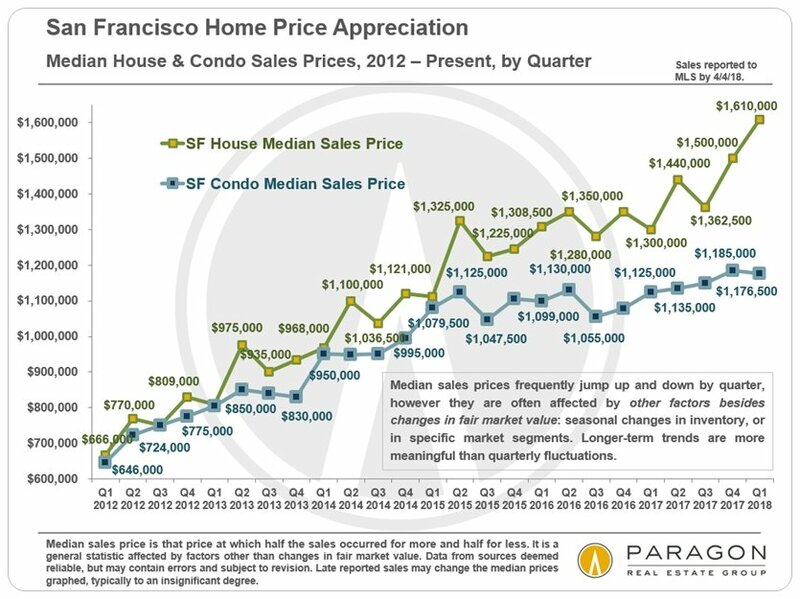 It’s not – on the contrary, Bay Area prices, including San Francisco, continue to hit new highs. Read on! The sources of the data behind the above (and many more) articles: an online survey by a PR company; an analysis of traffic on a real estate website; the alleged cost of a U-Haul to Las Vegas; anecdotal opinions from a handful of venture capitalists on a mid-west bus tour; and new U.S. census data, more often than not selectively or misleadingly quoted to sound most ominous. 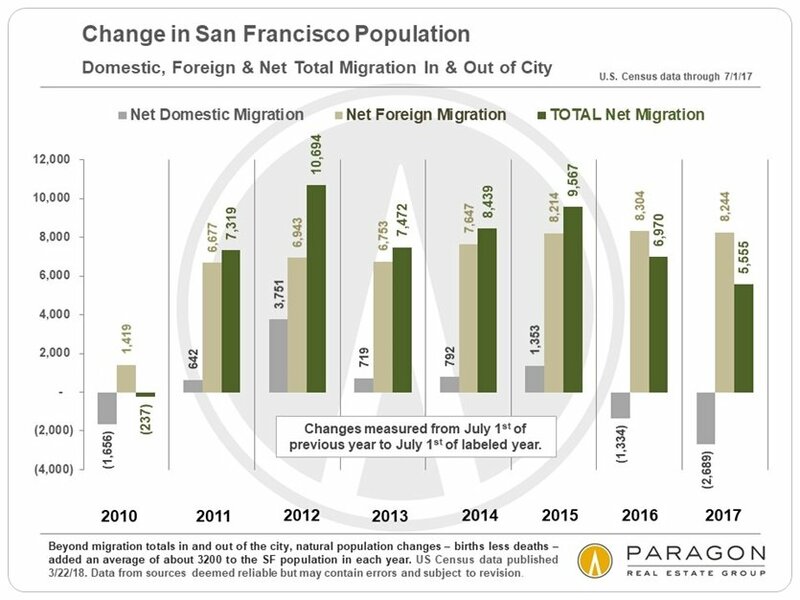 More people are NOT leaving San Francisco or the Bay Area than arriving. When you tally both domestic migration and foreign migration, more people are arriving than leaving. It is true than in the past 2 years, domestic net migration has shifted to a net loss, but that deficit is still overcome by the large positive in foreign immigration. 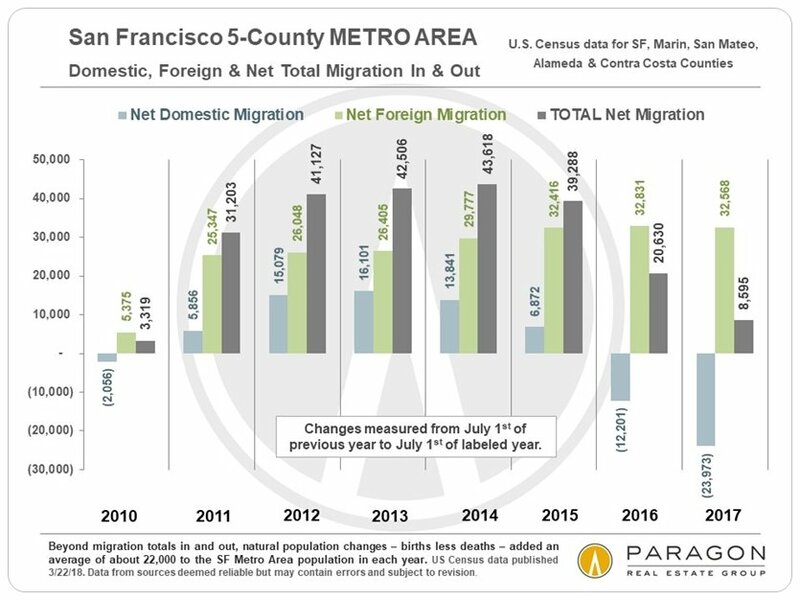 Is the shift in domestic migration worrisome? Yes, if it continues to grow. But it is not cataclysmic in its current proportions, and there are further underlying factors to consider, which shall be discussed later in this report. 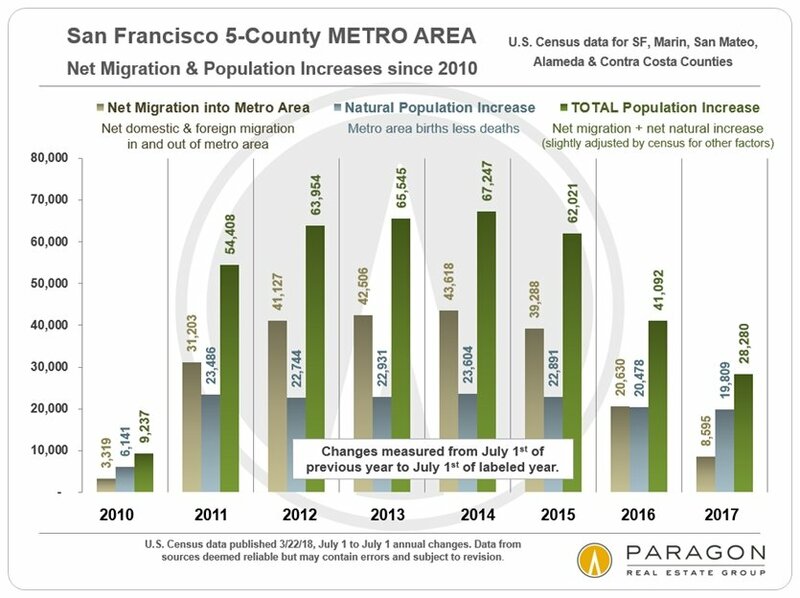 The Bay Area population is still growing both from migration and natural factors (births less deaths), albeit at slower rates than the torrid pace of previous years. 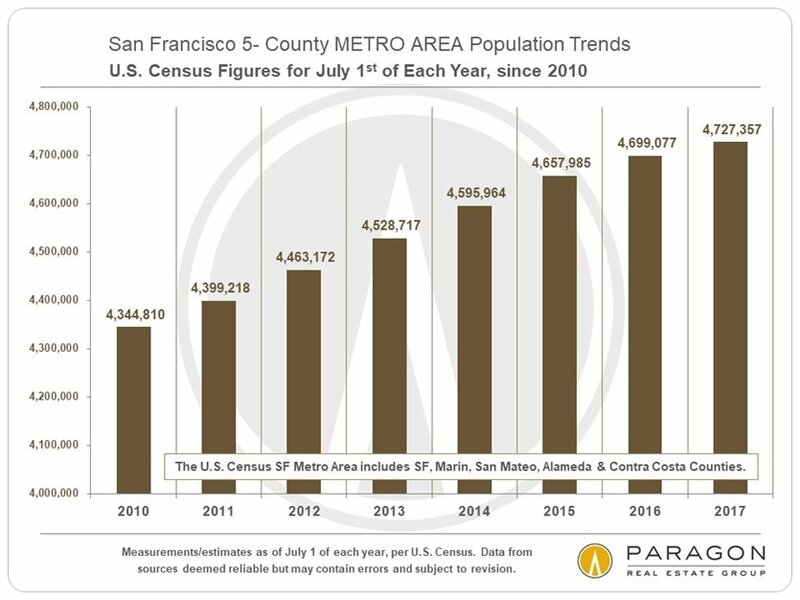 As the WSJ admits in its article, SF and SF metro area populations are not shrinking: The SF Metro area population increased by .6% in the last 12 month period, as measured by the census through 7/1/17, which is one tenth of 1 percent lower than the .7% national average. 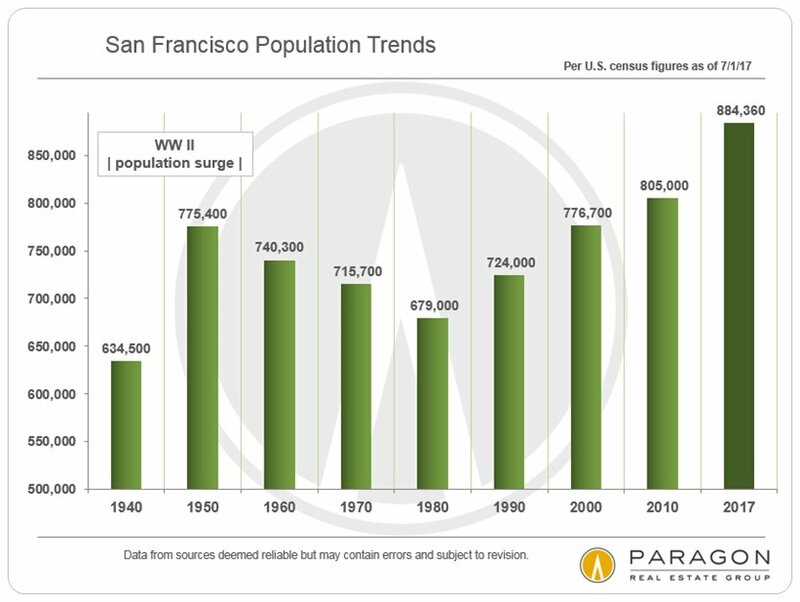 A slower rate of growth than our recent population explosion is actually a good thing, since the Bay Area is bursting at the seams from growth without concomitant improvements in housing supply and infrastructure. A significant portion of those leaving the Bay area are retirees, cashing out on high home prices to move to less expensive locales, such as other counties in California, and Nevada, Arizona and Oregon. This is not a new phenomenon, as it has been going on for decades, though it may have accelerated in recent years, since cashing out has become so much more lucrative. 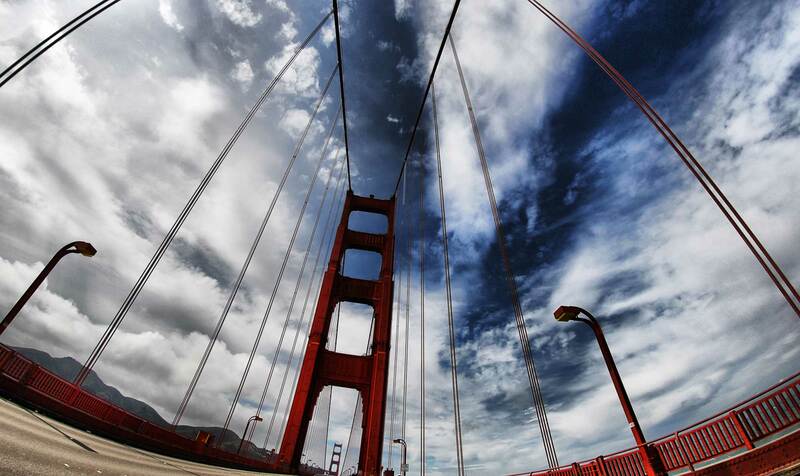 Most of those coming to the Bay Area are coming for new jobs, and the Bay Area remains a magnet for many of the best and the brightest around the world. Besides which, every year, thousands of Bay Area students graduate from schools like UC Berkeley, UCSF and Stanford, to take jobs locally as well. 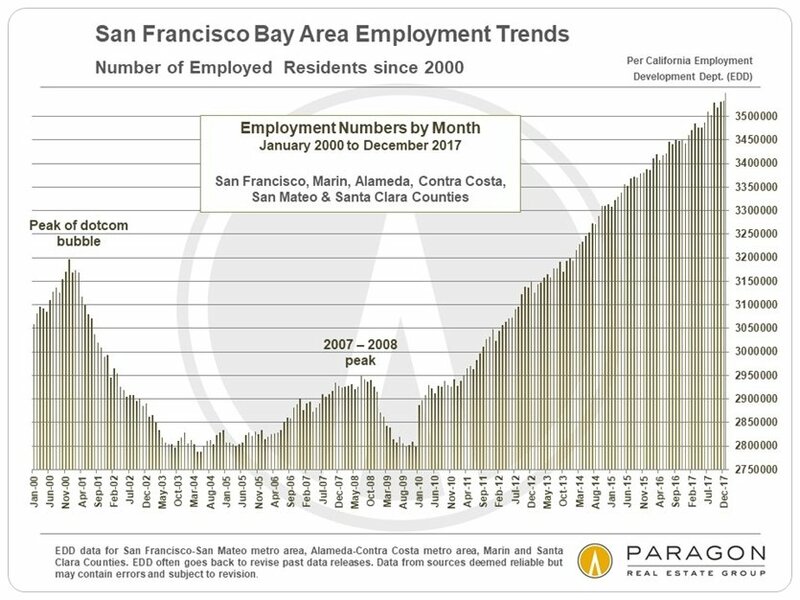 Economically, the Bay Area is trading many residents who are, to a large degree, checking out of employment for people in the prime of their working lives. A new 2018 study by BuildZoom (whose accuracy we cannot evaluate) found that the median income of people moving into the Bay Area was substantially higher than that of people moving out: According to the study, from 2010 to 2016, newcomers out-earned relocating residents by about $18,700. Millions of square feet of new commercial office space continue to be snapped up as soon as they come on market, even before the buildings are finished, and the only possible reasons are new businesses arriving and existing high-tech, bio-tech and fin-tech businesses – such as Google, Facebook, Amazon, Dropbox – continuing to expand, both of which are fueled by continued hiring. 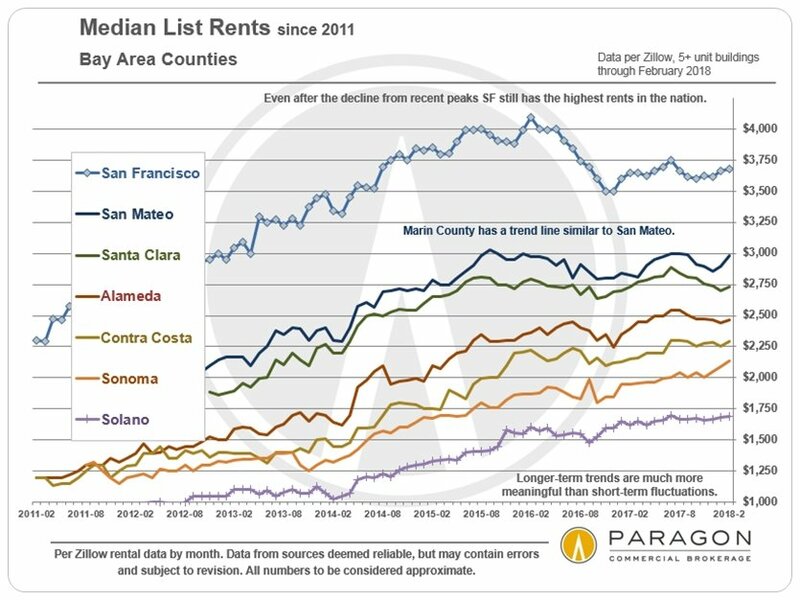 Last, but not least, neither Bay Area home prices nor rents have, so far, been dropping – most median home sales prices jumped in 2017 and early 2018, and rents stayed relatively unchanged – which one would expect to see if the doom-laden media articles were correct in their analyses. hundreds, local business continue to expand, and the Bay Area undoubtedly remains one of the most innovative and dynamic economies in the world. And despite all its faults and problems, it is still, in my opinion – and the opinion of most of the people I’ve met around the Bay Area, the country and the world – one of the great metropolitan areas on the planet. As always, your questions, comments, “likes” on FB/LinkedIn, and referrals are always appreciated! Smart, informative read. Always so helpful to look into numbers and create a truly clear picture from them. It will be interesting to see how the next couple years unfold. Previous PostPrevious On the 112th Anniversary of The 1906 Earthquake, Is San Francisco Ready for the Next Big One?